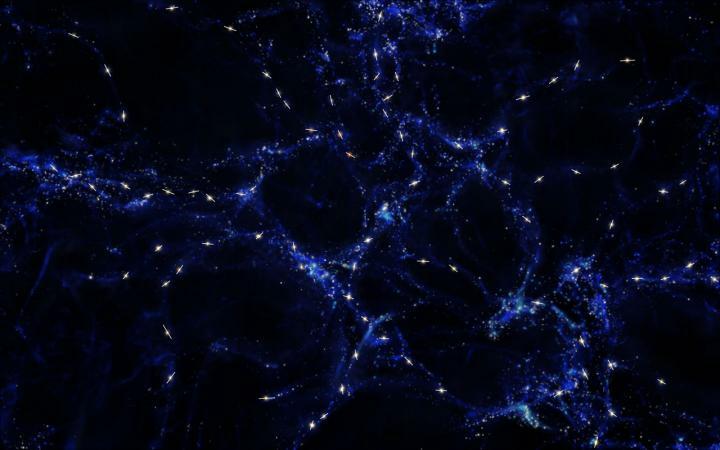 Caption: This artist’s impression shows schematically the mysterious alignments between the spin axes of quasars and the large-scale structures that they inhabit that observations with ESO’s Very Large Telescope have revealed. These alignments are over billions of light-years and are the largest known in the universe. The large-scale structure is shown in blue and quasars are marked in white with the rotation axes of their black holes indicated with a line. This picture is for illustration only and does not depict the real distribution of galaxies and quasars. “A correlation between the orientation of quasars and the structurethey belong to is an important prediction of numerical models of evolution of our Universe. Our data provide the first observational confirmation of this effect, on scales much larger that what had been observed to date for normal galaxies,” adds Dominique Sluse of the Argelander-Institut für Astronomie in Bonn, Germany and University of Liège. This research was presented in a paper entitled “Alignment of quasar polarizations with large-scale structures”, by D. Hutsemékers et al., to appear in the journal Astronomy & Astrophysics on 19 November 2014.